With a choice of sizes, capacities, readabilities and options, Adam counting scales can easily accommodate counting, check counting, filling, checkweighing and totalization needs. They are able to quickly and accurately count parts, saving time in manufacturing applications and reducing waste when filling packs. 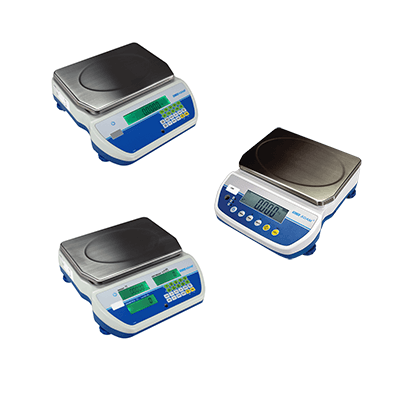 Simple to use, Adam Equipment's counting scales are available with a single display, or with three displays to simultaneously show unit weight, count and total weight. Adam offers dual counting scales, which maximize efficiency by allowing the use of a second auxiliary platform when counting large quantities. The CCT offers intelligent functions that are practical for shipping and receiving, warehouse use, and production facilities. Help reduce waste by using the CCT to quickly check the number of pieces in a container. Ideal for inventory control or packaging tasks, the CKT can save money by reducing waste and overages. CBD has the ability to connect to a larger, optional remote base to count large numbers of items in oversized containers. Users can switch between weighing on the built-in pan or auxiliary platform. GBC offers a combination of features and durability, making it well-suited for industrial counting tasks. A numeric keypad simplifies unit weight and sample entry, while the display shows total weight, unit weight and number of pieces. Designed for heavy-duty industrial tasks, GFC can capably handle capacities up to 660lb/300kg. Holiday season is upon us, and that means increased business and presents to send.